In Japan, while most of us foreigners are complaining about the bitter cold, Japanese farmers and fishermen across the nation are putting that dry, frigid air to good use. Although a somewhat rare sight in large cities, in rural areas, it’s not uncommon to witness strange bodies of floating tentacles or long curtains of noodles swaying in the winter breeze. “Cold wind drying” is a traditional method of food preservation that is still practiced today. This simple, economical way to prevent fresh foods from spoiling also gives rise to some breathtaking, bizarre and somewhat otherworldly scenes. Let’s take a look at some surprisingly beautiful photos from Japan of fish and vegetables hanging out to dry. 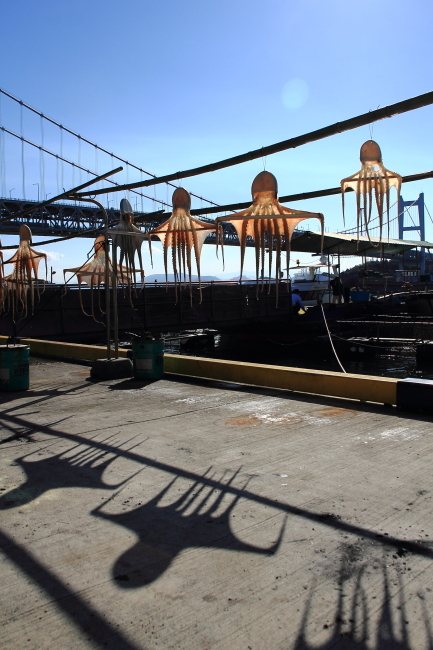 ▼ A thin wooden dowel spreads the long tentacles of each hanging octopus, making them look as if they are swimming through the air. 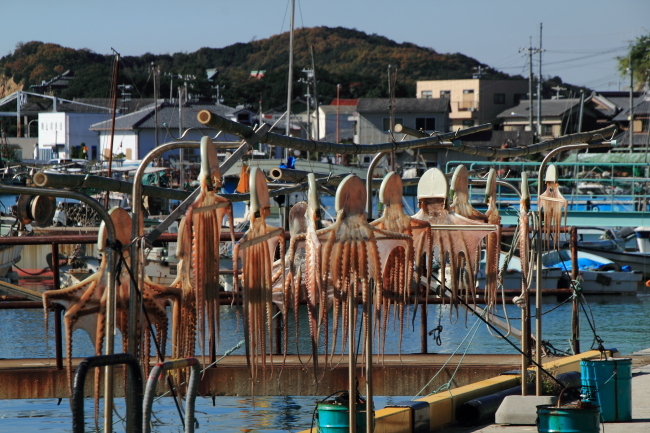 ▼ Hanging near the sea, the pink cephalopods seem to stretch in vain towards the waters they came from. ▼ From this angle, the dried squids look like a garden of ethereal flowers. 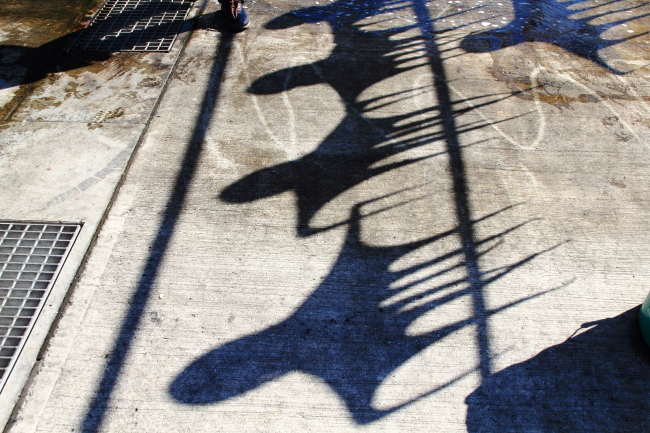 ▼ But the shadows cast on the docks are positively ghoulish. ▼ But if you look closely, you’ll see that the tiny strands are actually somen noodles. 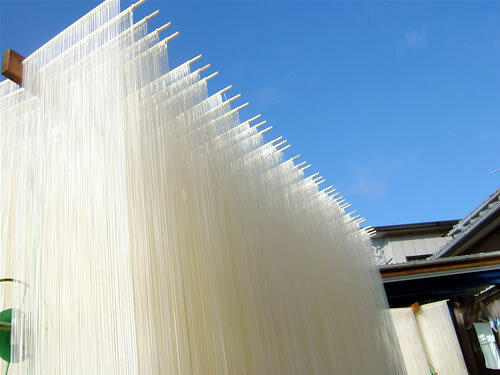 ▼ Each individual noodle is dried and then cut to size. ▼ Radishes are hung out to dry in December. The cold winter air gives them extra sweetness. ▼ Each purplish red globe looks like a tiny ornament hanging from a green stem. ▼ They may look like carrots, but these long strips are actually sweet potatoes. ▼ They look beautiful hanging from the rafters. ▼ Nothing like a little winter sunshine to dry and sweeten up these potatoes. ▼ Long white daikon radishes are also dried in winter. ▼ It’s quite a beautiful sight to see thousands of daikon hanging out to dry. ▼ Different families have their own way of hanging the long white vegetables. It looks like a ladder! ▼ No they aren’t socks, that’s Chinese cabbage out to dry next to the laundry. ▼ Salmon gentle sways in the open air. ▼ A coat rack is dressed up with the help of tiny filleted fish. ▼ The small silver fish match the newly fallen snow. ▼ These pike fish sparkle as they stand up tall. It’s amazing how even the simplest things – fish hanging out to dry, red radishes bunched together – can produce the most beautiful scenes. We hope these pictures have inspired you to take time to admire and appreciate the little treasures hiding in everyday life.